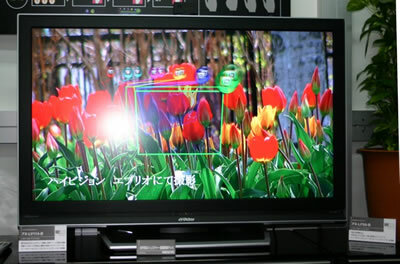 JVC has demonstrated a handclap and gesture recognition TV at CEATEC Japan 2007. JVC, apparently unaware that American "clapper" technology leads the world, has been doing its own research for the past two years. When the user claps his hands three times, icons appear in the center of the screen. 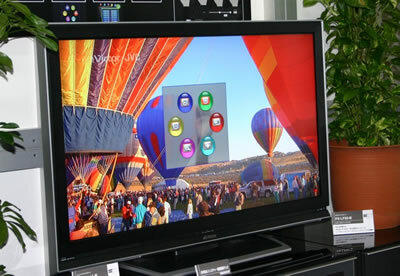 An image of the user's hand appears on the screen, tracked by a camera on top of the TV. The user can then choose an icon by "hooking it" with his finger. Demonstrating the operation of the "handclap & gesture recognition TV" with a camera monitoring a hand, which can operate the TV through its location and gestures. The camera is equipped on top of the TV. In the blue square frame in the center of the TV screen, six icons and the image of a hand being monitored with the camera were displayed. This user operated the TV with the hand raised up high to make it easy to distinguish a hand from the background, JVC said. As the TV recognizes a hand based on its shape, other things like sticks are not detected. If multiple hands are detected, the TV will give priority to the one at upper right, said JVC. A loud clatter of gunk music flooded through the Heart of Gold cabin as Zaphod searched the sub-etha radio wave bands for news of himself. The machine was rather difficult to operate... as the technology became more sophisticated... all you had to do was wave your hand in the general direction of the components and hope. For other gesture-controlled TV news, be sure to check out this earlier effort by Aussie researchers - Gesture-Controlled TV. Story via BGR and Nikkei.